​This card is speaking mostly about our emotions. Here we see the King in his armor with a sword in his hand. He’s here to help us in our struggle. He lends you his armor to keep you safe from criticism and any verbal attacks hurled your way. They cannot harm you. 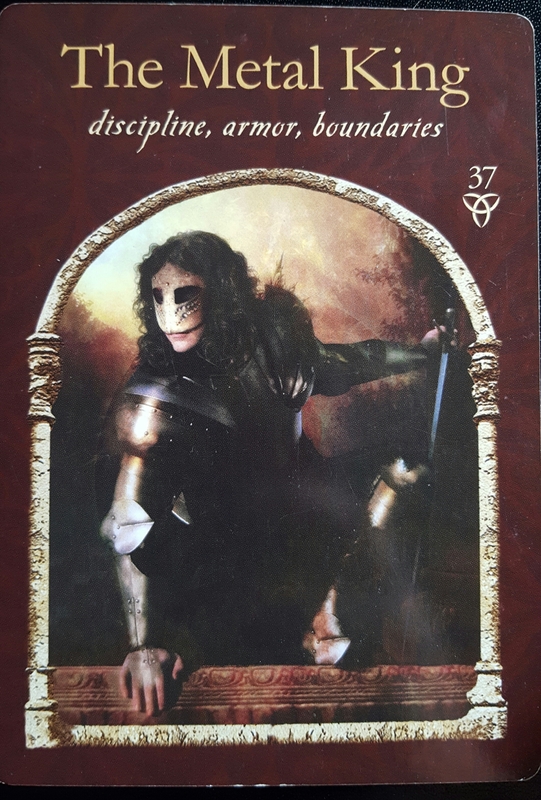 He indicates that now is the time to be clear about your personal boundaries. It’s important to establish and enforce a safe and healthy space so you don’t become overwhelmed or entangled in other’s emotions. These things all work together. A healthy sense of self along with strong personal boundaries creates a beautiful, sacred space within us, which acts as an armor against the army of emotions that continually try to beat against our minds. May we remember today to protect ourselves from any negative energies that are directed our way. May we counter these with unapologetic self-care and self-love. May we rise up strong and refreshed, ready to take on whatever comes next. 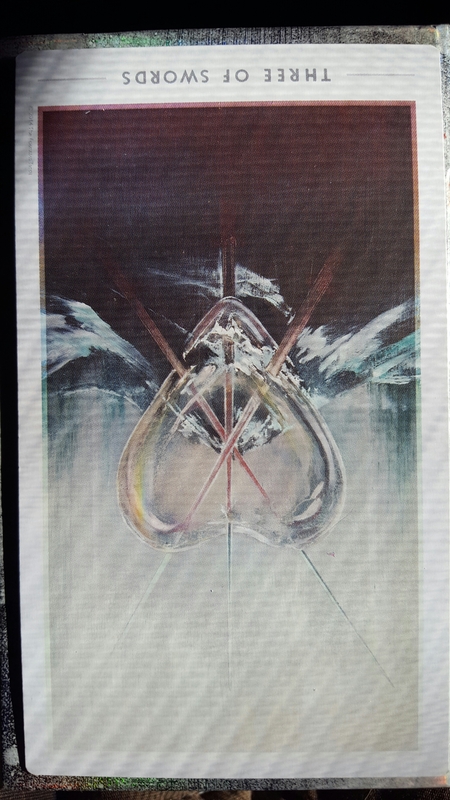 In its upright position, this card indicates the potential for our hearts to be broken. Reversed, there is a feeling that this has already happened. We’re lost in a sea of confusion and pain, trying to recover from something horrible that’s left us feeling empty. Although we may be in a period of shock and mourning right now, know that there will be brighter days ahead. This feeling of brokenness will not last forever. There is always hope. Please help us, Great Spirit, as we walk through this wall of grief. Let us mourn fully for what might have been, and then get up and do what we can to make this world one of peace and compassion for all. In its upright position, the Three of Cups represents a joyful celebration with family and friends. It exudes a feeling of joy, safety, and fulfillment in community. Life is good and we feel like partying! But today it’s in the upside-down, or reversed, position. In this position, the card takes on a different meaning. Today we may be feeling like our friends, family members, and neighbors are not as friendly, loving, or safe as we wanted them to be. There may be a general feeling of wariness in our lives and we don’t feel happy or joyous. 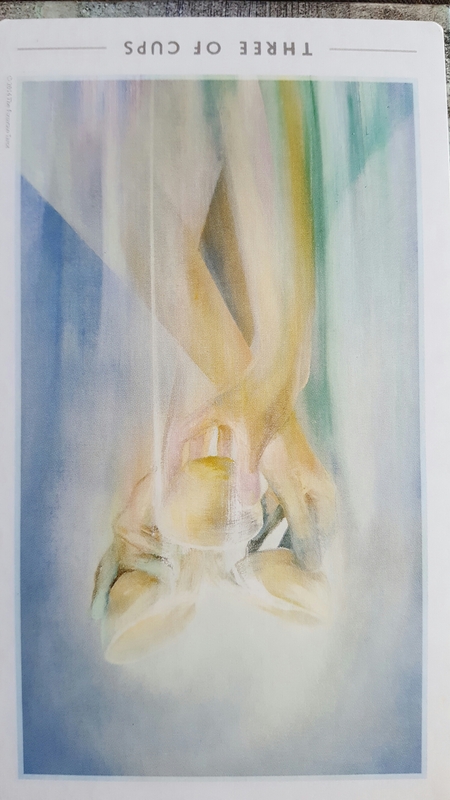 This card encourages us to reach out to others for support. Find a community you can trust and become part of it. Go where the love is and then be the safe space you always wished was there for you. May we turn outward in love rather than inward from fear today. May we open ourselves to both give and receive love from our family and community. May we be safe spaces for all who feel threatened and may we join together in meditation and action that will bring peace and equality to all. I have to admit, I’m not surprised this card came up today. Here we have someone who is clearly frightened, curled up in the fetal position in the dark. They are peeking out from behind their knees, watching as imaginary swords creep toward them. These swords represent the person’s many fears which are tormenting them. But there is good news! The swords aren’t real! They’re shadows, bending as they reach the person, heading toward their mind. They can’t do the person any physical harm. I would imagine this is how many people feel today, worried that horrible things are about to happen and imagining all the ways things could go terribly wrong. 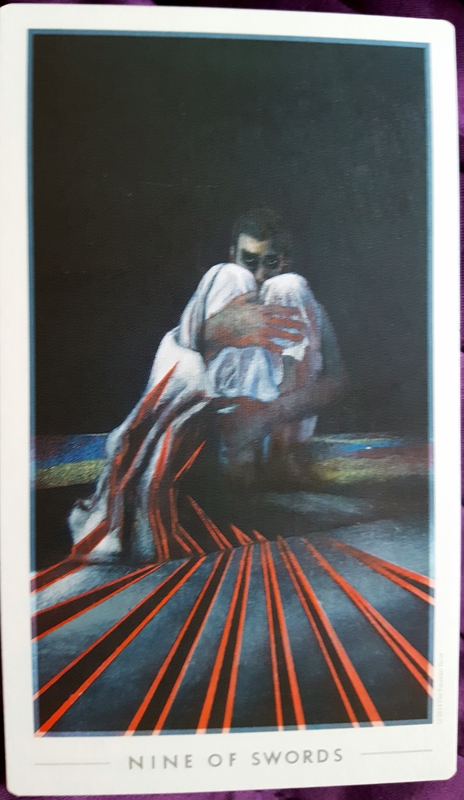 The message from the Nine of Swords today is that we’re caught in our own minds, paralyzed by fear. We’re scared and feel like the darkness is all we can see. It asks us to get out of our heads, to stop our ruminations on catastrophe, and to focus on reality. We cannot allow our fears to take away our power or to keep us from participating in life. May we have the strength today to confront our fears and render them powerless in the face of all we are capable of doing to make this world a safer place for everyone. May we remember that each day we have an effect on everyone we interact with, so may we choose to show all beings love and compassion. Things can get better, but for things to change, we have to change them. We each have a set of beliefs that we live by, right? They inform our daily choices and determine how we live our lives. Take a moment to think about what yours are. Jot them down if you want. Now, where did you get them from? What are they based on? Are they from your parents? Your religion? Your culture? Why did you make them yours? Using our beliefs, we build our view of the world. We make value judgments every day which are based on what we believe is right and wrong or acceptable and unacceptable. For most people, our sense of right and wrong is learned primarily from our family and the society in which we were raised. As a result, our judgments tend to fall in line with whatever our parents believe or whatever the dominant cultural norms are where we live. What we learn as we travel the world is that what may be unacceptable in one country or culture may be perfectly acceptable in another. Right and wrong are subjective. In my country right now, there seems to be a very prominent Us vs Them mentality. I believe this divisiveness is caused mainly by fear, ignorance, and a false sense of superiority. It drives violence and hatred and makes our world a more dangerous place for everyone. So here’s a thought and a challenge: what if we could strip away our closely held ideas of right and wrong that encourage us to judge and vilify our fellow human beings? What if we decided to see the value in people who are different from us? What if we rise up in our power to choose who we want to be and decide that we will LOVE instead of hate, practice empathy and compassion instead of judgment? What if we decided to STOP FIGHTING and instead START TAKING CARE OF each other? Please take a moment to consider: do your beliefs make our world a more peaceful, compassionate, and safe place for everyone? If not, why not ask yourself why you’re still choosing to believe them? In order to make our world a better place, we need to make better choices. I’m gonna spend some time imagining a better world tonight. Won’t you join me?